This study aims to determine the extent to which the implementation of Karimun District Regulation No. 6 of 2010 Concerning Arrangement Community Institutions, terkaitdengan implementation of the Neighborhood function in Tanjung Batu City District Kundur Karimun. The theory used is the implementation, in Van Meter and Van Horn Imolementasi is as actions undertaken by individuals, officials, or groups of governments or private directed at achieving the objectives outlined in the tujuanyang policy decisions. Then the indicators of this study diberdasarkan of Karimun District Regulation No. 6 of 2010 Concerning Arrangement Community Institutions, consisting of functions Neighborhood contained in Article 15.Metode in this study is ... .. with the population and sample Lurah Head, Head RW, Head of RT, and community or families (KK) in Tanjung Batu City District Kundur. The technique of collecting data that is used primary data dikumpulakn with questionnaire and interview techniques as well as secondary data were collected through direct observation kelapangan.sementara necessary data analysis technique is a frequency table with tools. Further analysis. Pelaksnaan study the function of the neighborhood in the village of Tanjung Batu City District Kundur are in the category of "Pretty Good" because the four indicators that authors assign all partially been running as well as it should. SYAWALUDDIN, M.; MONALISA, Monalisa. STUDI PELAKSANAAN FUNGSI RUKUN TETANGGA DI KELURAHAN TANJUNG BATU KOTA KECAMATAN KUNDUR KABUPATEN KARIMUN. 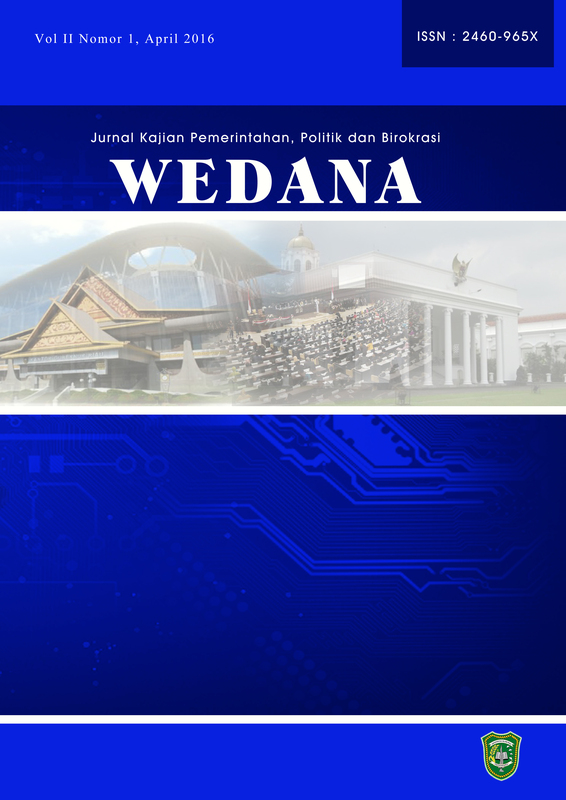 WEDANA: Jurnal Kajian Pemerintahan, Politik dan Birokrasi, [S.l. ], v. 2, n. 1, p. 71-86, july 2018. ISSN 2622-9625. Available at: <http://journal.uir.ac.id/index.php/wedana/article/view/1777>. Date accessed: 20 apr. 2019.